Exeter City Football Club have officially announced the online launch of a new short film, produced as part of the ECFC Museum project. The film, Disability and Football, uses interviews and archival material to take a closer look at how the Club works with people of all abilities, both on and off the pitch. 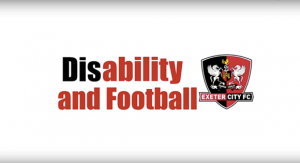 We at the Exeter City Disabled Supporters Association fully supports the video as do the Exeter City Community Trust, and features many of those people who work with Exeter City to make a difference, including Will Allan (ECFC community Trust DIO), Nick Saunders (ECDSA/ECFC DLO), Jeanne Jones (ECDSA committee member), Greg Hill (ECDSA member/ECFC programme seller) and Paul Farley (ECFC Director and Senior safeguarding manager & equality and inclusion lead). Will Barrett, who coordinates the museum project, and was part of the film production team said: “It’s always great to see how much goes on at City behind the scenes and in the community. The ECFC Museum is the latest initiative led by the ECFC History Group and Grecian Archive team, and is supported by the Heritage Lottery Fund and the University of Exeter. To learn more about the project, or discover how you might be able to get involved, please click here.